As one of the earliest black metal bands in Belgium (forming in 1988) Ancient Rites is also the most interesting of the country. In constant evolution the band has shed members and sounds over the years to arrive a concoction of popular styles without abandoning artistic integrity or musical merit. “The Diabolic Serenades” is the first and most crude sounding of all Ancient Rites releases, yet already its keen sense of melody, epic solos and traditional metal foundation are accounted for. Of all releases this one has the most death -, and thrash metal influences. The only things working against it are the unflattering drum production and studio processed vocals of bassist Gunther Theys. At this juncture the band was a power trio, consisting of vocalist, lyricist and bass guitarist Gunther Theys, lead guitarist Bart Vandereycken and drummer Walter van Cortenberg. The album bears a striking resemblance to the Mystifier album “Wicca” which was released two years before, in 1992. Both albums aim for a for the same writing style and atmosphere, although Ancient Rites is more death metal oriented in its writing, and far more percussive in terms of drumming. That both instruments feature as prominently as they do should come as no surprise, as all the music was composed by Bart Vandereycken and Walter van Cortenberg. The songwriting is sometimes hampered by the presence of only one guitar, but Vandereycken more often than not finds clever ways around these limitations. The bass guitar, in usage more than tone, isn’t as interesting as it could be, mostly due it merely doubling the guitar riffs. What the band lacks in subtlety and finesse it makes up in sheer variation and diversity in how it goes about accomplishing its songwriting objective. “The Diabolic Serenades” has a lineage in ancient thrash – and death metal rather than the formative black metal acts. Although steeped in anti-religious and Satanic imagery, a great deal of the lyrics already deal with historical subject matter, including French nobleman Gilles de Rais (‘Morbid Glory (Gilles de Rais 1404-1440)’), the Roman Empire (‘Crucifiction Justified (Roman Supremacy)’, Assyria (‘Assyrian Empire’) and local Belgian folklore and history (‘Obscurity Reigns (Fields Of Flanders)’ and ‘Land of Frost & Despair’). The remainder of the songs deal with the archetypical Satanic philosophy, such as ‘Satanic Rejoice’, ‘Death Messiah’, ‘Longing For the Ancient Kingdom’, ‘Ritual Slayings (Goat Worship Pure)’ and ‘Evil Prevails’. 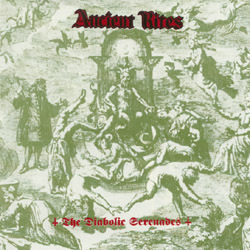 Over the course of its next albums Ancient Rites would gradually tone down its Satanic rhetoric in favor of exploring European antiquity, history and folklore. For the most part “The Diabolic Serenades” is the culmination of the band’s demo stage, and one of two records in terms of its central songwriting axis. 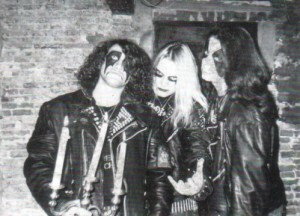 That Ancient Rites doesn’t conform to any philosophy, but its own is made abundantly clear by the fact that the band adamantly refuses to wear corpse paint in its promotional material, and to adopt unpronounceable stage names. Both these practices were standard for then-emergent black metal genre, and remain a staple of it to this day. The band’s integrity and honesty at the expense of artistic – and commercial success is its greatest strenght. One of the biggest strenghts of “The Diabolic Serenades” is the contrast between its mechanical brutality and atmospheric interludes. ‘Infant Sacrifices to Baalberith’, ‘Longing For the Ancient Kingdom’ and ‘Last Rites/Echoes Of Melancholy’ stand in stark contrast to the batterings of ‘Crucifixion Justified (Roman Supremacy)’, ‘Land Of Frost & Despair’, ‘Ritual Slayings (Goat Worship Pure)’ and ‘Evil Prevails’. In fact ‘Longing For the Ancient Kingdom’, a re-recorded cut of the band’s 1992 “Evil Prevails” EP, is the earliest instance of the band exploring its atmospheric side within its rather crude death/black metal framework. This track forms the architectural basis for the band’s later atmospheric and epic metal template that would be cultivated in earnest from the second, and third album onward. Being the earliest Ancient Rites release it captures the band at its most primal and ferocious. Bart Vandereycken is a commendable guitarist, and while his angular riffs aren’t always the most imaginative the fiery leads/solos is what he excels at. The drumming by Walter van Cortenberg mostly seems to be built around thrash beats, and somewhat early American sounding fills. 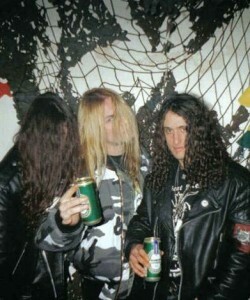 The demonic vocals by Gunther Theys, as goofy as they sound due to the studio processing, fit the album’s haunting atmosphere. A hissing vocal style, such as heard on the “Resurrection” EP (which was released the same year as this album) by American death metal combo Sadistic Intent would have fitted the album better in retrospect. The current vocals work for what they intend to convey, their sheer otherworldiness works in its favor. The production is a both a blessing and a curse. Once again the band convened at Studio 20 in Tienen, Belgium with long-time producer/engineer Louis Jans behind the console. The guitar tone is crunchy and thick, while the bass rumbles healthily in the background. The drums sound digital, and kind of plastic. The whole kit oozes an electronic vibe that never really improves. While the snares and toms sound digital, the kickdrums sound truly massive giving the record, along with the prominent bass guitar, its thundering bass-heaviness and weight. It is unclear whether an electronic drum kit was used during these sessons, or that it was merely due to production choices on the band’s end. Similarly a studio filter, or processor, was used on the grunts and rasps of bass guitarist Gunther Theys, which push them squarely into death metal territory. Even though it adds to the overall macabre effect, it takes some time getting used to – especially in hindsight since Theys would opt for a more natural and emotive vocal style past this debut record. Many of the qualms would be rectified on the successor to this album, while the sterile, digital drum tones would prove a continuing ailment for this band that even a move towards a high-budget, professional studio environment couldn’t cure. “The Diabolic Serenades” had the unfortunate distinction of being released through the doomed Afterdark Records, which declared bankruptcy shortly after the album’s release. This led to Ancient Rites embarking on a European tour in support of the album, without any product to push. The album is an ideal fusion of various streams of underground metal styles. The visuals might not be the most striking but they fit with the rather crude and primitive take on the genres the band mix on its debut. From this point onward the band would expand its musical, vocal and lyrical palette. “The Diabolic Serenades” is the culmination of Ancient Rites’ demo phase, and the only album of its kind in the band’s early canon. Much of what would make Ancient Rites the interesting musical outfit that they are is found here in its most embryonal form. This album lays down the groundwork for the much better material they would produce in the following years. In hindsight it looks corny compared and contrasted with the material the band would release in subsequent years, but the conviction and spirit present they weren’t able to capture or recreate on later, arguably better, albums. The 2013 demo recording of Slovenian all-girl doom metal combo Mist, aptly called “demo” to avoid unnecessary confusion, is a worthwhile demonstration of a young band taking a traditional and classic approach to a genre to its logical conclusion. The demo is significantly heavier than most of its more marketable peers, and avoids at least some of the trappings of the occult rock trend from which it no doubt benefitted. Re-pressed no less than three times on CD due to great interest, and eventually re-released by the band’s current contractor Soulseller Records, these five Slovenian girls might yet surprise the doom metal world in the years to come once they find their own sound. That the band was barely together for a year when these recordings were committed to tape shines through in the haphazard and sudden transitions of these two songs, some of which are rather rudimentary and forgettable. ‘Phobia’ is a straight-up rocker, and ‘The Living Dead’ is the earliest instance of Mist truly showing what they are capable of. Heavily inspired by Black Sabbath, although they are leaning more towards the heavier end of the spectrum instead of the expected psychedelia. While Mist is hardly the sort of band to imitate the brooding and droning Thorr’s Hammer, or the more classic doom oriented Rituals Of the Oak, the girls draw inspiration from two wells at once making the music accessible to the general metal populace while simultaneously offering something of interest to those more familiar with the doom metal subbranch. Mist hardly qualifies as a traditional – or epic doom metal combo in tradition of Candlemass, Rituals Of the Oak or Solitude Aeturnus – or the more droning variant such as Salome and Yob, but its inherent heaviness is a defining factor as to where their interest in the genre lies. It is exactly the slowest song on the demo that is the most interesting. Not only because it avoids the currently popular occult rock sound, but because Mist is plainly better when they slow down to a snail’s pace. That isn’t to say that the more straightforward Black Sabbath material (‘The Living Dead’) is any less interesting – the more traditional doom cut (‘Phobia’) is just more captivating and stronger all around. It was a wise marketing decision to include one song of each segment of the doom demographic they wish to appeal to. ‘The Living Dead’ is a stronger closer, but it sounds too similar to many other bands in this genre. It isn’t a track to differentiate itself, or Mist, from the releases of Seremonia, Kröwnn, Serpent Omega or bands of similar ilk. The most interesting track is ‘Phobia’ because it explores slower, altogether darker territory. What does stand out are Nina Spruk’s powerful vocals, even though she’s occasionally plagued by her unflattering East-European inflection. Spruk is anything but your typical soaring doom singer as she has the sort of bellowing vocals that wouldn’t feel out of place in a stoner rock – or groove metal band. Her sultry whispers in ‘Phobia’ form the highlight of that track, and one can only hope that she’ll explore her vocal range on future recordings. Spruk’s vocals especially fit well with the slower nature of a track like ‘Phobia’ where Mist lays off the Black Sabbath grooves, and actually sounds like a genuine doom metal band. It would be advisable for the girls to explore this avenue to a great degree on future releases, although the Black Sabbath sound is more easily marketable. One can only imagine what Mist would be capable of if they further slowed down their music. Mist would be a powerful entity as the female equivalent to Winter circa “Into Darkness” or Yob circa “The Illusion Of Motion” and “The Unreal Never Lived”. Couple a slower overall pace with Spruk’s wider vocal palette, and something truly spectacular would be bound to happen. As of now Mist is content to uphold the status-quo, which is okay – but they are capable of so much more than just that. This demo proves just that. The demo was recorded in November 2013 at Klub Jedro in Ljubljana, Slovenia with Benjamin Kic and the band producing. Kic provides the two tracks with a concrete sense of bottom-end heaviness, mostly thanks to prominent place for the bass guitar. There’s an almost analog warmth to the production. That the production is slightly more textured sounding than many other occult rock bands imitating the early Black Sabbath sound works in the band’s advantage. The guitar tone is crunchy and sufficiently heavy while not sacrificing any clarity in the process. The psychedelic artwork was created by drummer Mihaela Žitko, and for the most part it is the sort of vista you’d expect with a stoner metal band. While Mist is a doom metal band at heart, it are the stoner aspects that prevail the most on this demo, and that is a pity because they are capable of so much more than this facile and forgettable song and dance. 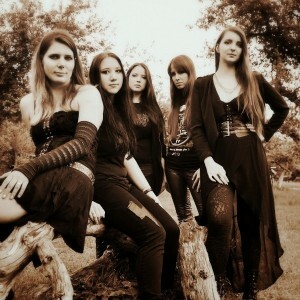 Recently the girls of Mist were offered a recording contract with Dutch label Soulseller Records. 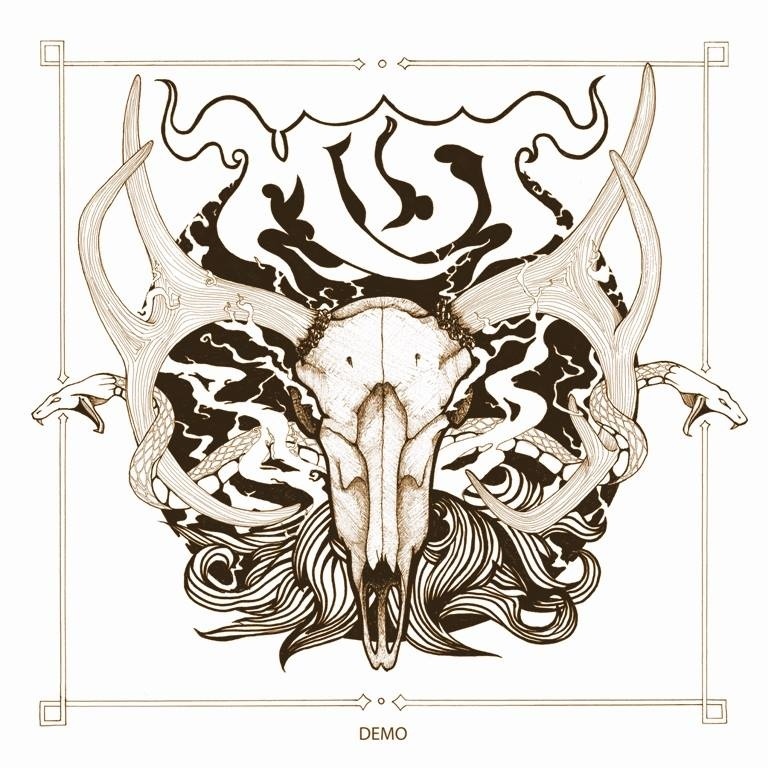 “Demo 2013” in a lot of ways sounds exactly like you think it does, but beneath the surface something is brewing that the band hopefully will capitalize on in their future output. Whereas bands as High Priest Of Saturn and Seremonia rely heavily on psychedelia Mist from the onset chose a heavier and more metallic direction, which they’ll hopefully explore further.